Throughout the set you will find appearances from: Benny Carter, Shelly Manne, Barney Castle, Victor Feldman, Red Mitchell, Joe Mondragon, Plas Johnson, Bob Cooper, Richie Kamuca, Pete Candoli, Frank Rosolino and Henry Mancini. Imagine, if you will, that you are a hard drinking, chain smoking detective in the city of angels. Across from you sits a blonde bombshell put on this Earth to break a man’s heart. She’s brought you a case filled with murder and intrigue. You sit back taking it all in feeling the need for an inner monologue to set the scene for a classic noir adventure. But something is missing. Every good detective needs a soundtrack and now thanks to Moochin’ About every gumshoe in town has a tune to fit even the darkest of cases. 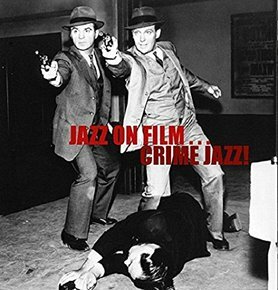 Encompassing fifteen full soundtracks across eight discs Jazz on Film: Crime Jazz is an unapologetic love letter to television noir. It captures a world of gumshoe detectives, gun toting criminals and deadly femme fatales. Jazz and crime has always been a match made in heaven. Jazz paints a perfect soundscape for a world of crime noir. These sixteen soundtracks ranging from 77 Sunset Strip to Peter Gun features some of the biggest names in music history. Renowned television composer Warren Barker, responsible for the memorable incidental music from small screen classic Bewitched sits comfortably with multi award winner Henry Mancini. Mancini’s legendary theme for Peter Gun is a particular highlight in an amazingly comprehensive set. More than just an instrumental collection there are several vocal performances that give a real taste of the source material especially apparent with The Naked City soundtrack. This set covers a comprehensive range of television detective shows from the golden age of American television. The set itself is incredibly stylish and looks as cool as it sounds. Each of the eight discs are encased in gorgeously designed slip covers housed in a stylish clamshell case which also includes an 80 page booklet featuring an introduction from crime writer Max Allan Collins. This deluxe set is perfect for anyone with an interest in television or jazz history and is certainly value for money. Is this set likely to appeal to the average fan? The honest answer is probably no. The music here is excellent and the composers collected here is phenomenal but it is very much music of its time. The casual fan is unlikely to truly appreciate what an awesome trove of fantastic treasures their ears are feasting on. This is a time capsule and only those with a real interest in unlocking the musical world of yesterday are likely to appreciate this incredibly well put together set. But does that matter? This set wasn’t made for the casual fans. This set is lovingly crafted by those that love their crime jazz for their fellow fans. This set is not about changing the modern world it’s about riding a wave of nostalgia across the seas of jazz history. Grab your pistol and fedora it’s time to hit the streets of L.A. followed by the sweet sounds of jazz.